Your office phone system is hardly the biggest consumer of electricity in your office – that would be Courtney in accounting – but every Watt counts when it comes to trying to avoid boiling the planet for our kids, or saving money on power bills if you aren’t into science and book-learnin’. A Zultys telephone system laughs at the gluttony of other IP phone systems and digital PBXs when it comes to energy consumption. 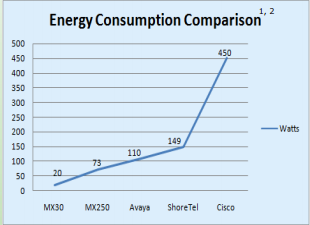 An MX250 telephone system packed full of applications uses less energy than a light bulb. Competing systems that require multiple switches, servers, and peripheral products draw a multiple of that power. Not only is Zultys simply hyper efficient by design, the consolidation of different applications into a single server appliance not only makes administration simple, it helps your company do its part in the fight against global warming while saving you money on your utility bills versus the competition. Zultys loves mother Earth more than other phone systems.